The North Carolina State University College of Veterinary Medicine and the Karen Beasley Sea Turtle Rescue and Rehabilitation Center recently celebrated 20 years of partnering to preserve and protect sea turtle populations. 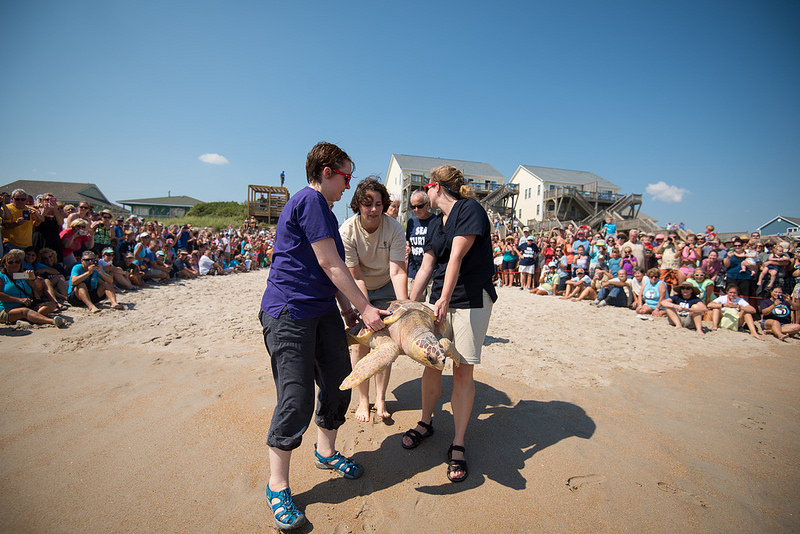 To mark the occasion, the groups held a special release of five rehabilitated turtles—two loggerheads and three greens—on the coast of North Carolina. Hundreds of onlookers also celebrated the release, according to the university. The turtle release was timed to coincide with the college’s student clinical rotation—this year marks the eleventh year that fourth-year students from the vet college have had the opportunity to experience a clinical rotation in sea turtle rehabilitation and rescue. The majority of the Beasley Center rescued turtles can be housed and treated on site, including more simple surgeries for cases like removing fish hooks, but for more serious or complex circumstances, occasionally turtles are brought to the CVM campus, where they can be treated by the specialists at the NC State Veterinary Hospital, the university noted. To date, the Beasley Center has rehabilitated and released hundreds of sea turtles, and has grown from an initial one-room 850-square-foot building to its current 13,600 facility at Surf City.